At Shipley, we understand that Middle School is a time of significant change for adolescents. They are developing physically, emotionally, socially, and intellectually, and we provide the appropriate environment to nurture this growth. 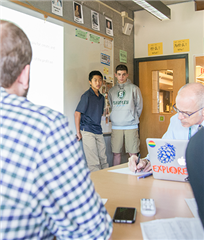 With guidance and empathy supporting an academically challenging curriculum based in critical thinking and creative exploration, our Middle School students develop deep knowledge of themselves as learners and as people. Our Middle School curriculum is developed with the adolescent brain and learning styles in mind, serving not only as a transition between the foundation of Lower School and the rigorous college preparation of Upper School, but also as an important academic journey of its own. Visit the Middle School curriculum page to learn more. 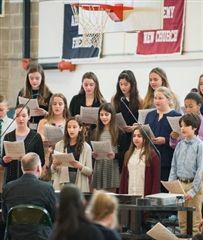 Character Education continues seamlessly from Lower School into Middle School, encouraging students to discover their passions and talents as they begin to be self-sufficient, learning to navigate the halls, as well as the direction of their learning path. As they become more aware of their own identity as people and learners, they begin to understand and ask questions about their role in the greater community. While 6th graders look inward to determine what kind of learners they are, 7th and 8th graders learn about responsibility and leadership—and they all apply these lessons to their lives in school and beyond. The Character Education program continues to be integrated into every classroom, and students are further supported by an advisory program that creates an open dialogue between students and teachers, making students feel safe and respected as they explore the issues that affect their lives. Communication is key, and teachers, parents, and students work as a team to ensure each student is having the best educational experience possible. Mini-courses: These meet regularly and change several times each year. Recent mini-course titles have included: Stock and Chess Club, Indoor Wiffle Ball, Backgammon, Reading Olympics, Movie Club, Science Olympiad, Pickle Ball, and Meditation, to name just a few. Service: Students are offered a range of opportunities to choose from and do community service on almost a monthly basis. These opportunities take them into our surrounding suburban community or into Philadelphia. Student Leadership: Students are encouraged to participate in leadership opportunities throughout the Middle School. 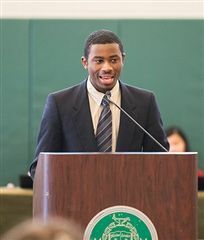 Whether running for elected office as grade-level representatives, participating on the voluntary Student Leadership Team, becoming a student leader Service Leader, presenting sports reports or mobilizing the Middle School for our annual Speak-Up!, Impact Day, or Ezra Day. Included is information on the required and recommended reading for students entering Grades 6 through 8. List of 22 news stories. 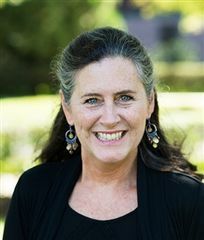 Shipley Middle School Latin teacher Anne Smith has been recognized by the Classical Association of the Atlantic States (CAAS) for her more than 30 years of service to the discipline of Latin. 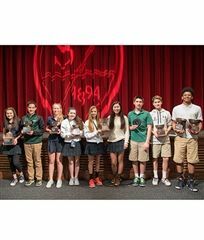 The annual Middle School Academic Awards Ceremony recognized eight students for their achievements throughout the school year. As the school year comes to a close, our seniors are starting to say their goodbyes. 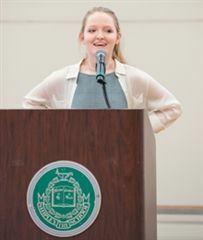 This post is taken from a speech by senior and All School President Katie Balun, who spoke at a recent event welcoming new Shipley parents to our community. 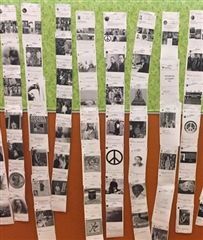 Studying Inspirational Figures is a hallmark of Shipley’s sixth-grade curriculum, culminating in an Instagram-style final project in history class. Here, students in Ms. Boreanaz’s class give us an inside look at the project process. 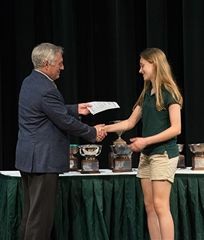 The annual Middle School Academic Awards Ceremony recognized 11 students for their achievements throughout the school year. What’s so special about Friday’s one o’clock bell in the Middle School? Mini courses, of course! These half-hour sessions focus on letting the students take control to explore new hobbies, grow their passions, and learn about themselves in the process. Read more about mini courses in the Middle School. 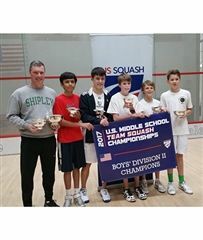 Shipley’s Middle School boys’ “A” squash team won the U.S. Squash Division II National Championship on Sunday, January 29. 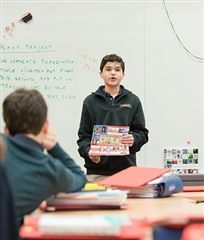 Inspired by the popular television show "Shark Tank," eighth graders in Sean Legnini's technology class developed their own social networks and vied to survive pitching their technologies to a panel of sharks. While they didn't receive a monetary award, the real value was in the skills learned in the process. 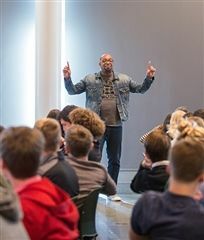 Newberry award-winning author Kwame Alexander had Middle and Upper school students roaring with laughter during his talk on Monday morning. His talk focused on perseverance, inspiration, and using writing as a tool for expression and creativity. 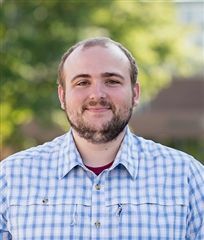 "I am a third generation Shipley alum who dreamed of one day teaching at the school that helped build my character, develop my intellect, and shaped my global outlook." 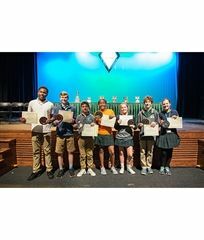 Nine Shipley eighth graders were honored with various academic and athletic awards during the annual Middle School Awards Assembly. “Students are all on a path from concrete to abstract thinking, and my job is to get students further down that path,” explains English teacher Kirsten Small. 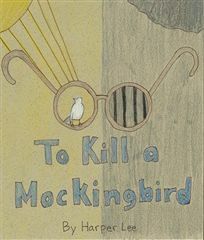 Every student makes the leap, she says, and it usually takes place during her class’s study of Harper Lee’s classic novel, To Kill a Mockingbird. Learn about why this important book resonates with Shipley's seventh graders and what they learn from it. 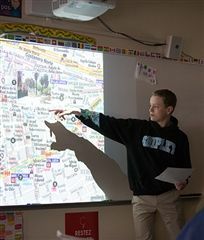 Drawing inspiration from shows like The Layover with Anthony Bourdain, students in Annette Marrecau's seventh grade Spanish class plan what they would do on a 24-hour layover while building confidence to speak publicly in a foreign language. 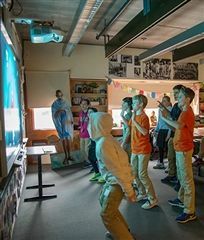 The Middle School teaching duo of Christine Hutchinson and Peter Schumacher teamed up to create a musically-inspired interdisciplinary English and History project for their eighth graders. Read more about why they brought Bruce Springsteen, U2, and more into the classroom. As part of the Middle School Service Learning curriculum, known as Service Fridays, students travel to off-site locations to volunteer their time. One local organization, SHARE, featured Shipley's volunteer efforts in their monthly newsletter. A summer obsession with the popular HGTV and DIY Network tiny house television shows inspired Middle School science teacher Caroline Feldman. 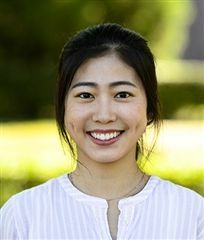 With a curriculum based on sustainability, she challenged her eighth graders to create their own, fully-sustainable, tiny houses. How does Shipley develop in its students the inherent qualities of a good leader? By understanding child development from Pre-Kindergarten through grade 12, Shipley’s program challenges emerging leaders to take risks and build the confidence to succeed. adults will know your elementary school (or LS depending) child as a learner and a person each year. Learn more about Lower School. of Shipley graduates attend college within a year of graduating. Learn more about Shipley’s College Counseling Program. 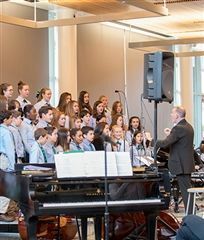 of Lower School students have hands-on exposure to string, woodwind, and brass instruments. Learn more about Music at Shipley. of Lower School students learn how to resolve conflicts, negotiate, present their point of view, and serve the community in our internationally recognized character education program. Learn more about Character Education. of students benefit academically AND socially from developing emotional literacy skills. Learn more. real-world capstone service learning projects completed by Shipley students each year. Think Care Act in 5th grade, a Leadership Project in 8th grade, and the Senior Service Project in 12th grade. key content elements of the SEED curriculum Pre-K through 12th grade: Self-Awareness, Social Awareness, Self-Management and Organization, Responsible Decision Making, and Relationship Management. Learn more about SEED. colleges have recruited Shipley athletes in Divisions I, II, and III. art courses offered in the Upper School. years of integrated core values curriculum offered to all students. minutes of class time devoted to Shipley's core values curriculum Pre-K through Grade 12. Shipley colleagues trained in emotional intelligence strategies. 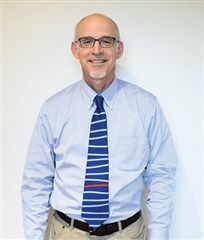 honors courses to challenge students. music ensembles in each division. 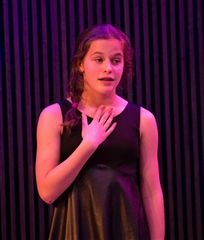 theater productions in the Middle and Upper Schools annually. specials (music, art, science, PE, character education, and world language) enhancing Shipley’s core curriculum. ﻿athletics championships in the past seven years. % of teaching faculty with advanced degrees.